3x THULE 591 ProRide Roof Mount CYCLE / BIKE CARRIER 20KG Model. Swipe Left / Right to see more Images. 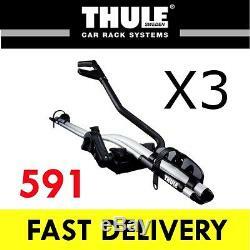 This Listing is for 3X Thule 591 Bike Carriers. The ProRide 591 is a very well thought out, well made bike rack. It's quick and easy to install, easy to use, and looks great. Here's some additional explanation of the features which all add up to make this a 5 star product. The frame holder will stay in whatever position you place it in, so you can position it before lifting the bike onto the roof. The shape of the aluminium bottom tray isn't just designed to look good. Assuming that you are parked on the flat, or facing slightly downhill, the bike will roll forwards into the jaws of the frame holder, i. The plastic wheel holders have an edge to them so you're less likely to overlift, i. Dump the bike beyond the bike carrier and onto the car roof. The further the bike carrier is to the middle of the car, the bigger the lift and the bigger the stretch. How to fit this item. When the bike frame is resting in the frame holder you'll support it with one hand and use the other to turn the tensioning knob which is probably at shoulder level. This has a one way ratchet, i. This is what Thule call their "Self adjusting frame holder". You release the ratchet with a push button; it releases entirely, making it easier to take the bike off. It comes complete with 20mm x 20mm adapters for aluminium T-track section bars, suitable for all the Atera, CRUZ, Prorack Whispbar and Thule bars we sell. All these fittings now use an M6 fine thread. If you have other aerobar types, e. BMW, then you need their adapter set 889-1, shown below. The Thule 591 fits roof bars to 56mm wide. It holds bikes with down tubes from 22mm to 80mm diameter (up to 80 x 100mm for oval frames), with a maximum weight of 20kg. Each 591 has two One Key System locks - one locks the carrier to the roof bars, the other locks the bike to the carrier. It's TÜV approved and meets the "City Crash Test" criteria. PLEASE NOTE: EACH BIKE CARRIER IS SUPPLIED WITH A UNIQUE LOCK AND KEYS, IF ORDERING MORE THAN 1 UNIT WE CANNOT MATCH THESE LOCKS. Please double check items before installation or painting. We cannot accept responsibility for costs incurred from incorrect items being painted or fitted to vehicles. Please provide a contact telephone number during checkout, as this will enable us to quickly contact you in the unlikely event that there are any issues with your order. We provide a range of genuine and universal products. Our aim is to provide the accessories you need to personlise your vehicle, protect your vehicles interior and make driving easier. We also offer a great range of universal products, made to fit most vehicles. Thank you for taking the time to look at the Auto Accessorize Store. If you country is not there, we do not deliver to your country. If you are receiving a parcel from a courier and the packaging looks damaged, make sure you sign for the item as unchecked or possible damaged. The item "3x THULE 591 ProRide Roof Mount CYCLE / BIKE CARRIER 20KG Model" is in sale since Tuesday, June 19, 2012. This item is in the category "Vehicle Parts & Accessories\Car Accessories\Touring & Travel\Bike Racks". The seller is "auto-accessorize-uk" and is located in Midlands UK. This item can be shipped to United Kingdom.